Well, after Beast in Black released Berserker last month, I thought I'd heard the best album of the year. However, Nemesis, from relatively new band Defecto, gives Berserker a run for its money in my book! Nemesis is incredible. The start of the album is extremely heavy and sounds amazing, but near the end of track three, I started to tire a bit of the heavy sound and began to want a reprieve. Unlike 98% of albums that would have just continued the barrage, the guys from Defecto must have realized that the heavy sound wasn't maintainable, and they brought in a style change on the fourth track to a lighter, more straight-up metal sound without tons of instrumentation. The rest of the album continued that pattern of changing styles to avoid boredom and/or ear fatigue, but it never lost coherency. Absolutely brilliant songwriting and arranging. Especially considering the fact that this is only Defecto's second album, I'm completely blown away by the maturity level of this album. On top of the absolutely incredible job the band did arranging the album's tracks, the music itself is also amazing. The vocals on this album are so good that I wouldn't be surprised at all if Nicklas Sonne made his way into my top 10 vocalists of 2018 list. The guitar work on this album is nothing short of amazing; it has everything from heavy riffs to shredding to some almost flamenco-sounding guitar on Ode To the Damned. On top of that, the guitar tone is excellent - that was one of the first things I noticed on this album. To top everything off, the bells, synth, and orchestration on the album sound amazing. Overall, I can't believe how good this album is. Even though Defecto isn't well-known, if they this up, I think they're going to have a huge following someday. Also, Nemesis is in the running for BPMR's 2017 album of the year, which will be announced at the end of this month, so stay tuned through Facebook at https://www.facebook.com/BPMetalReviews/. DEFECTO seamlessly blend beautiful melodic parts with the more aggressive elements Fast-paced, hard-hitting, anthemic and in some ways, slightly haunting are all ways to describe Defecto’s new album, Nemesis Prime Collective. The Danish four-piece (a remarkable fact given the absolute wall of noise this album gives off) have produced something rather incredible here. As someone who is unfamiliar with this band, it was really a surprise at not only how quickly I was absorbed by this, but also just the sheer intensity with which Nemesis pummelled me into submission. Even tracks like ‘The Sacrificed‘ and ‘Ode to The Damned’, which slows things down drastically don’t feel out of place amongst the utter brutality. Tracks like ‘Ablaze’ and ‘Savage’ are perfect examples of what you can expect from this release, beautiful melodic parts blended seamlessly with the more aggressive elements. Defecto seem to have perfected a blend of subgenres here, with each track often showcasing more than one, no easy feat, yet one that Defecto have achieved with such consummate expertise that nothing ever feels forced, or stale. Instead, the elements of southern rock, metalcore, doom metal and melodic rock all ebb and flow with an almost effortless ease you’re never questioning if something doesn’t work, just taken up in it all. It was a real struggle to find anything resembling a fault with this, and to mention any would just seem nitpicky and negative for the sake it. It was a genuine treat for the entire 56-minute runtime and has me now watching Defecto more closely. Så slår de til igen. Danske Defecto gør ikke tingene halvt på deres andet udspil Nemesis, der følger op på det anmelderroste debutalbum Excluded fra 2016. Man taler om den svære to’er, men ikke for Defecto. De gør det bare dobbelt så hårdt på deres nye udspil. 12 stærke prog. metal sange buldrer afsted som et massivt godstog i fx ”Endlessy Falling”. Ustoppelig for nye teknisk innovative kompositioner med internationale træffere som ”Savage” og ”Ablaze” over i symfonisk metal på de episke hymner ”The Sacrificed” og ”Ascend To Heaven”. Det er nyt. Det er spændende. Melodisk og samtidig hårdt. Musikerne spiller med musklerne, fylder numrene med spændende riffs og magiske guitarsoloer, der hver gang overrasker. De fire gutter med Nicklas Sonne ved roret som sanger og producer får det hele til at lyde så enkelt og ligetil, men samtidig komplekst. Og sikke en produktion. Alle instrumenter er i front, ingen mudder, men CSP Clean Smashing Production (ja, okay et udtryk jeg lige fandt på). Defecto kan sagtens fylde den store scene på Copenhell 2018 og blæse øens beton til smulder. Fremtidens metal sker på denne plade. Du kan nå at se Defecto live her i Danmark til en billig billetpris, for inden du ser dig om, er Danmarks kommende eksport metal draget på verdenstogt for at spille med de store. Mine højttalere ryster endnu. Nemesis is the second studio release from Denmark’s Progressive Metal/Power Metal band Defecto. Continuing with the original line up intact, featuring vocalist/lead guitarist Niclas Sonne, Frederick Moller on guitar, Thomas Bartholin on bass, and Lars Jenson on drums, Defecto builds upon the groundwork laid on last year’s debut Excluded. Nemesis takes on a darker tone overall, the lyrics centering around the theme of enemies. The songs are well written, and expertly executed, with Sonne not only handling guitar and vocal duties, but producing and engineering as well. Nemesiskicks off with a haunting instrumental piece, “The Final Night Of Silence”, and launches from there right into very heavy territory with the title track, “Nemesis”. Sonne utilizes vocal techniques from soaring harmonies to guttural growls as the centerpiece of every song, and it works over Defecto’s Progressive, Melodic music. Capped with shredding lead guitars and tastefully utilized keys, every song covers the sonic spectrum, whether in the heaviest tunes like “Endlessly Falling” and “Before The Veil”, or the almost 80s influenced “Ablaze”. Defecto have definitely put forth an impressive sophomore effort in Nemesis. 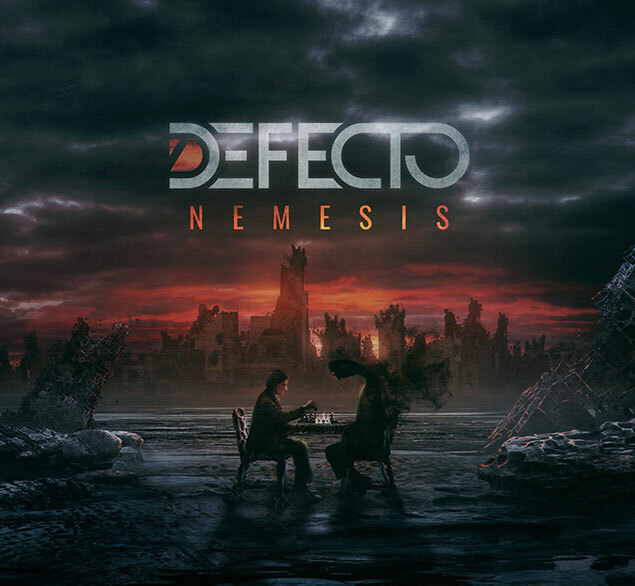 Fans of Melodic Power Metal, Progressive Metal, and those impressed with Defecto’s debut will definitely enjoy Nemesis. Nemesis is all about the melodic, progressive and technical aspect of metal music, where lead singer Nicklas Sonne will often remind you of a young James Hetfield in a more melodic and evil way. With inspirations from Symphony X, Dream Theater and Metallica, Defecto gets all the best things to shine from the different genres within the very genre of metal, and they’ve successfully succeeded in creating a musical landscape that’s unique and has huge potential. Where ‘Savage’ is the more “rocknroll inspired Volbeat meets Metallica but still has Defecto in it” And ‘We’re All The Enemy’ is a trash pounding masterpiece, Defecto has really hit a wide range of well-written songs that all deserves to be heard.